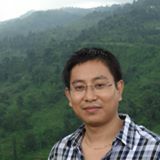 Salam Pradeep Singh is a Research Associate at the Bioinformatics Center Nagaland University, Lumami, Nagaland, India. 1) SP Singh, CR Deb, SU Ahmed, Y Saratchandra, BK Konwar (2014) Density Functional Theory Studies on Non-Steroidal Anti-Inflammatory Drugs Acetic Acid Derivatives of Cyclooxygenase Inhibitor. J Bionanoscience, 8, 1–7. 2) Y Bashir, SP Singh, BK Konwar (2014) Metagenomics: An Application Based Perspective. Chinese Journal of Biology, Hindawi, 146030, 7. 4) K Sagar, SP Singh, KK Goutam, BK Konwar (2014) Assessment of five soil DNA extraction methods and a rapid laboratory-developed method for quality soil DNA extraction for 16S rDNA-based amplification and library construction. J microbiological methods, 97, 68-73. 8) SP Singh, BK Konwar, RL Bezbaruah, TC Bora (2013) Molecular docking and in silico studies on analogues of 2-methylheptyl isonicotinate with DHDPS enzyme of Mycobacterium tuberculosis Medicinal Chemistry Research, 22, 10, 4755-4765.